So, we went to PAX. PAX Prime. PAX Prime 2012. In Seattle. Things happened there. It was awesome. Sorry, this is pretty disjointed because the combination of near-total lack of sleep and adrenaline rush amazing-ness of the event has left us confuzzled with joy-induced delirium in the week we’ve been back. Gah! So many hyphens! In full truth and honesty, I went into PAX with less than an optimistic attitude. We worked our jolly rears off in the run-up to Labor Day weekend, but we just didn’t have enough time. As you may or may not know by now, we do contract work and that contract work is what has allowed us to bootstrap the development of Delver’s Drop to its current state. 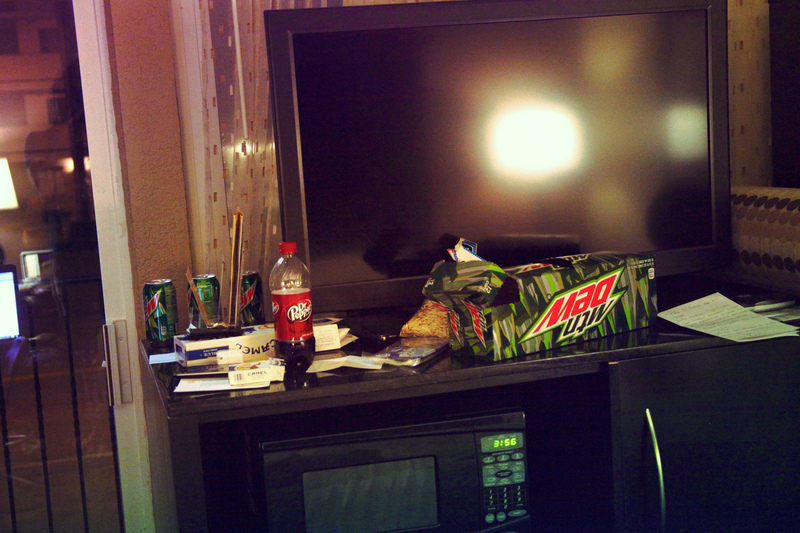 This sums up our pre-PAX experience pretty well: a frantic struggle to finalize the demo fueled by cigarettes and Mountain Dew and energy drinks. At the same time, contract work requires a huge time commitment and in the end I was worried that what we were able to put together in the time available didn’t do the game justice as a demo. Don’t get me wrong, we had made huge leaps and bounds into the tech and had final-ish quality art. I spent a good deal of time writing up room layouts, floor plans, enemy assignments, etc *by hand* in XML to get us a playable demo. It was a stellar effort from all involved. And I just wasn’t satisfied. So we’re on a plane to PAX *bam* we’re at the hotel *bam* it’s Thursday mornin’ and we’re setting up the booth *bam* OHCRAPOHCRAPOHCRAP it’s Friday morning at 9am *BAM* the doors open and.…! And people came in. And they wanted to play our game. They wanted to ask questions. They wanted to know about what we were making and we were ecstatically happy to indulge them. 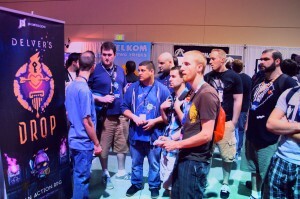 The game demo we showed was early, early, *early* alpha in its features and people loved it. It had an awesome character, sweet environment art, enemies you could hack at with a sword, and physics-based movement. That was enough to spark interest and then we got to talk about where we want to take it, and people were glad to hear it. Most of the time a line existed of people waiting to try out the demo. I think between the four of us we literally talked to nearly a thousand people — maybe more — which was just a small number of the ones that wandered by and watched. We gave out what we thought was a generous 3-day supply of info cards and buttons by the end of Day #1 and had to rush order reinforcements to make it through the weekend. We talked ourselves hoarse, and merrily repeated the same description over and over. Explaining our intended goals helped solidify what those goals were — at least in my mind. I can’t say enough good things about our experience residing within the Megabooth perimeter. 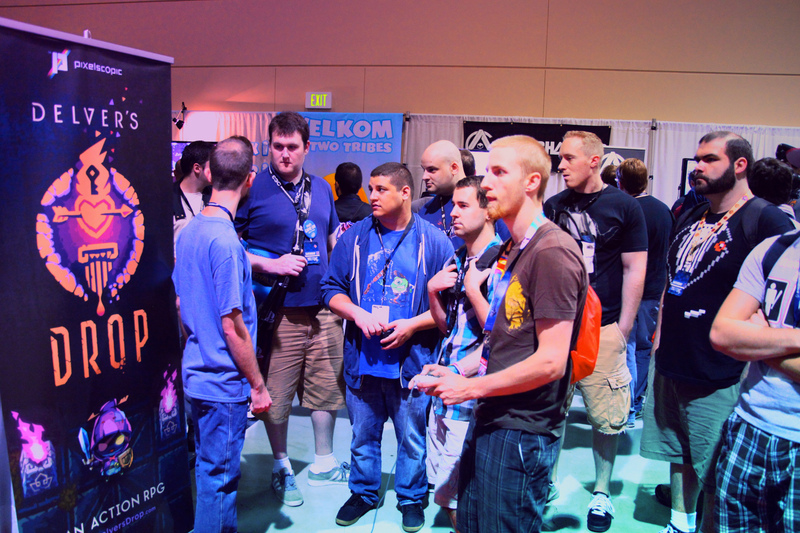 Our fellow indies were extremely helpful in offering advice in the run-up to PAX and also while we were there. Our fellow devs were also interested in what we were cooking up, just as we’ve been interested for some time now in what myriad mad ideas are set forth from their teams and released upon the world. Ben Rud, our PAX Enforcer liaison, was among the most helpful and chill people I’ve had the pleasure of working with. I hope we have him again next year. Here’s to you, Solution (Ben). Ok, final thoughts. Seattle is a great town, but we already knew that. PAX-goers are an amazing lot, keen to listen and eager to discuss; I think that anyone truly interested in honing their craft must value this with high priority. We tested the waters with our game idea and DDrop has passed the public interest test; full steam ahead is the next course of action. Thank you, thank you, thank you to everyone who has shown even the slightest interest in what we are working on. 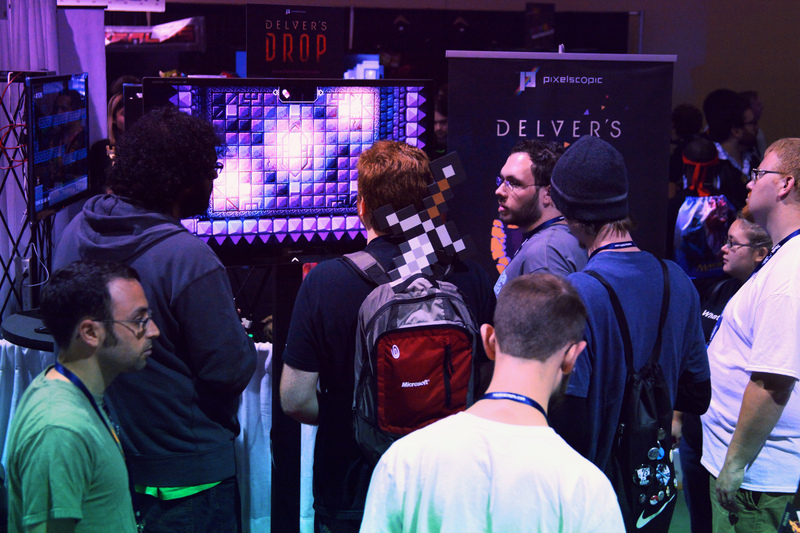 This entry was posted in News and tagged company news, Delver's Drop, editorial, Megabooth, PAX by Ryan Burrell. Bookmark the permalink.